I like wearing a Pashmina to cover up my shoulders for meetings when I wear spaghetti straps, as I can easily loose it once I am back at my own desk. Yes, it's great to have something to cover up with in a meeting! So glad I could inspire you to try them! Yes, they work so well casually and in an office! That first lace pencil skirt is one of my very favorites that you own. LOVE it paired with that gorgeous blue bag! It is such a fun statement skirt! I think this is such a pretty way to stay cool and look professional. I don't have any like this!! These are such pretty outfits. You're right that a cami is an elegant staple that works really well for a work look with a pencil skirt. I love the two ways you styled this look. Both super cute, I love the fit of the white one, too bad I'm too scared to wear white myself, haha! I've been trying to branch out and wear white more - especially on office days when it's just my clumsiness I have to worry about and not the boys spilling something on me, haha! Love this whole look! I hope your Monday is off to a great start! 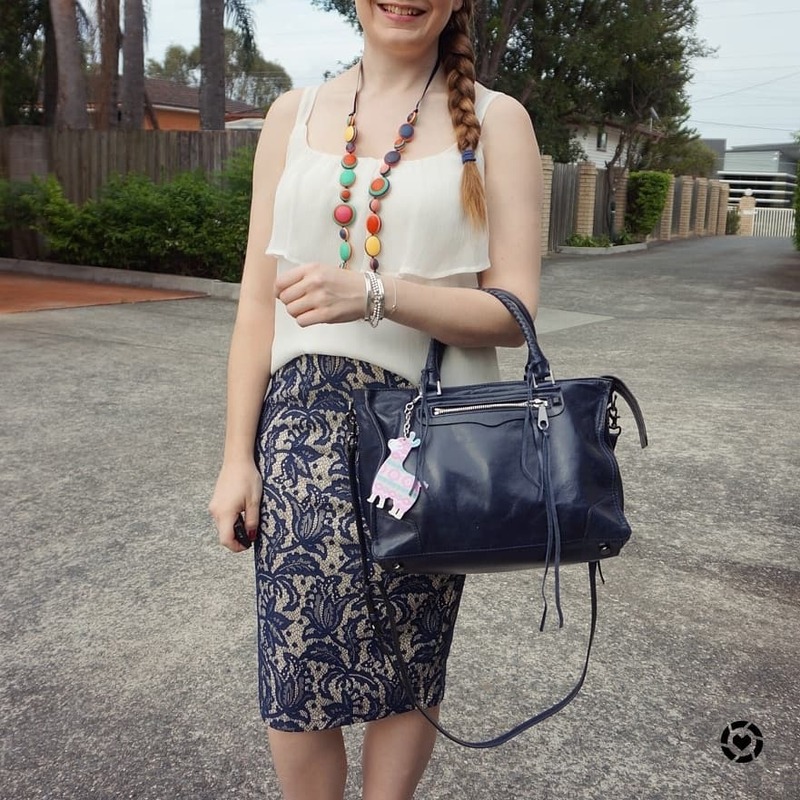 Love how that first blue skirt pairs with your cami! Paired with a cardigan both of these are perfect for work. Amazing how much extra wear we can get out of something when we layer for work. Layering works well in the cold office aircon too! A very nice and chic ensamble for work! In both versions you look very lovely and appropriate! I like Camis, but I always feel like I can't wear bra with em. Lol!! They're so freeing. You look wonderful in your outfits. That skirt is so lovely. haha yes, ones with thicker straps are the best for me, I can't go bra-less after breastfeeding, haha! I love both of these pencil skirts! That cami in the first look is so chic. Thanks for the link up! Hi Mica, you look very professional, but approachable! And, I love your hair pulled back, to show your pretty face! Happy New Year! Thanks Rebecca! I need it pulled off my face with this heat, haha! These are both such lovely outfits for the office - these nice camis are my preference for layering, instead of a tee or t-shirt fabric (which reads too casual for my taste). That lace skirt is my favourite piece of yours! Thanks Sheila! They are definitely a dressier option than a standard tee! It's always crazy to think we've got so much in our closets we still have lots of pieces we've never worn together before! I love your peach cami with the pop of turquoise! Yes! It really shows me I have a lot of different options without shopping! Both of these outfit are super chic. I so can't wait for warmer weather so I can wear more skirt to work. Hope you have a great week. That little llama charm stands out in these two outfits! I've tied scarves to my bags, but I have never tried a charm! They are so fun! I need to get a few on my wish list. They would be a great gift idea! Both of these outfits are really cute! I got rid of many of my camis years ago because I hated wearing strapless bras. Now I'm trying to find a few neutral ones I could wear with blazers and cardigans! The ruffle cami is so classy! Hope you had a great Monday! Loving all the "L" things in this post especially that lace skirt and how cute is your llama keychain?! haha yes, lace, llama and linkup! I never thought of it like that! That necklace in the first outfit is so fun and I love the colors. I do love this cami too! I wear camis too in spring and summer, they are so easy to style. I am so jealous of your weather, it's so cold and windy here today, I miss summer! Oh man, that Llama wins the internet. That is such a cool accessory. Love it so much, and I'm guessing so does the boys. Cami's are such a great piece for summer. I just rediscovered them again today. So nice to wear one out in such a horridly hot day! It is such a fun bag charm, I love it! :) And yes, camis are so good in summer! What a beautiful outfit Mica, you look fab darling. Have a wonderful week ahead! I loved a bag and the whole outfit. I really like the ruffle camis - I don't have one and I think I'm going to trade in some that I don't wear this year for one with the ruffle (buy one, donate...sell...whatever... two). I really love the second look best because I, too, love the peach and navy together. The patterns on both skirts are beautiful. And I love the llama keychain - what a great little accent! I'm sorry you weren't feeling well and I hope it wasn't long-lasting. I love the idea of a link-up and look forward to going through it when I have a little more time. Your skirt is so cute you know! I love how you look and I think that black is so cute. I love this lightweight and feminine outfit, you look stunning! I am living vicariously through your summer vibes right now while the States are in a deep freeze, haha! You look so pretty in these ruffle tops and how cute is your bag charm. You know how much I love seeing you wear pencil skirts, Mica, they're so flattering! I love the blue design here; such a gorgeous print and ideal for mix-and-matching with various tops :) Have a fabulous week! I really like the combination of a ruffled cami and a pencil skirt. It works great in both outfits. Both pencil skirts are so pretty, light one as well as the darker blue one. I love their patterns. The blazer is a great addition to the second look as well. Sorry to hear you weren't feeling best that day, I hope you feel better now. Have a great rest of the week! I love link ups, and that skirt you are wearing!! Adding this party to my weekly list. Thank you! And thanks for linking up! These are two easy to recreate work looks that certainly fit the bill. I tried linking but was not successful. Thanks Lorena! looks like it worked in the end, thank you for linking up! Yes, this look is perfect for office work these days. 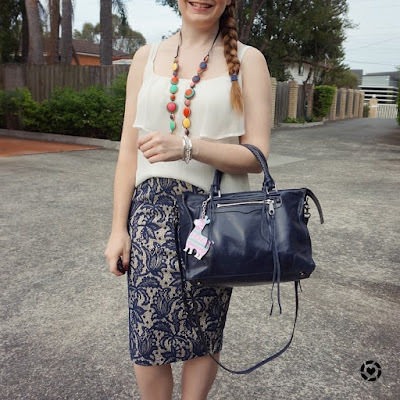 I like the lace skirt paired with a navy bag. You always find the cutest Minkoff bag. Hope you have a fun week, we are having a week of heatwave in Sydney at the moment. It's hot here too, although I know it's not as bad as your heatwave! Both of these looks are so pretty--I love this formula of a printed pencil skirt with a pretty cami. The matchy matchy navy in that first look, I love it! Have a great week Mica! Thanks Shea! 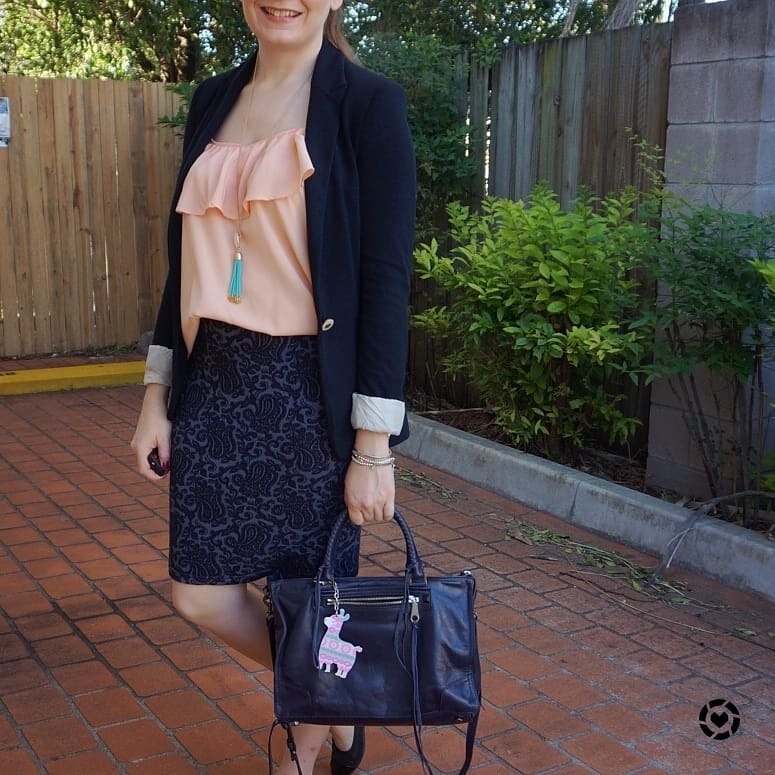 It's a great outfit formula for work - you know I love my outfit formulas! These are great office looks. It's always hard for me to dress in the summer for work because it's warm outside but cool inside! Hope you're having a nice week and thanks for the link up! Hi Mica thanks for the invite to join your linkup. I've entered one but a few posts I'm writing that will be perfect for this .thank you for giving me the opportunity to do work wear blogs . Perfect. You looked great in the blazer over spaghetti strap peach top! I'm sorry to hear you weren't feeling good at the time though. I hope you are much better now. Like others said, the skirt is bomb! The jacquard pencil skirt is a beauty. Same as the lace pencil skirt. Love your hair-do and makeup, Mica! Always on point :) I wish you a wonderful week ahead and stay hydrated! Thanks Shanaz! I am feeling much better. And these skirts are a fun take on a classic pencil skirt! I absolutely love the skirt dear, classic pattern. That looks like the perfect tote—Rebecca Minkoff makes such great bags! Love the little charm on it too! I always need inspiration for business attire! Both of these looks are so cute! My favorite is the second outfit! So pretty! Glad I could give you some inspiration! Great office attire Mica! It can be hard to dress comfortably for the office when it's hot but you did a great job! I feel better equipped for summer dressing than winter dressing, haha! It always amazes me when I happen to realize I have never worn my oldies together. You did make a great look! I wish I could see it with cardi on as well. On the side note: This LAMA is ADORABLE!!! Im craving summer seeing these pretty outfits! I also love the little keychain on your bag, so cute!